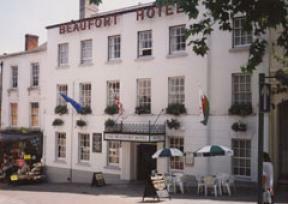 The Beaufort Hotel01291 622497work01600 712668fax Hotel16C inn in the heart of Chepstow. Excellent food (AA rosette) both restaurant and bar meals, popular bar. As a hotel which has been trading since the 17thC our rooms are varied in size and shape. Some have original oak beams others are more modern having been added over the last few years. Whatever the style of room all are en-suite and we endevour to ensure a high degree of cleanliness and comfort. Most rooms are enabled for wifi internet communication. In keeping with a hotel of this nature there is no lift but we do have rooms on the ground floor for those who struggle with stairs. 16C inn in the heart of Chepstow. Excellent food (AA rosette) both restaurant and bar meals, popular bar. As a hotel which has been trading since the 17thC our rooms are varied in size and shape. Some have original oak beams others are more modern having been added over the last few years. Whatever the style of room all are en-suite and we endevour to ensure a high degree of cleanliness and comfort. Most rooms are enabled for wifi internet communication. In keeping with a hotel of this nature there is no lift but we do have rooms on the ground floor for those who struggle with stairs. The Beaufort Hotel is a family run business and we pride ourselves on giving efficient, friendly service and good value for money. We have 23 en-suite bedrooms, an excellent restaurant and Florence Court, a banqueting suite which has facilities for weddings, conferences or parties.